Those blankety blank oil companies are making obscene profits. I know what I’ll do; I’ll not buy gas on April 15th. That will show them. Boy, are they going to feel the pain of my wrath! I’ll fill up on the 14th or wait until the 16th, but on the 15th? They are going to suffer! On April 15th 2011, Let us unite in protest of escalating fuel prices. 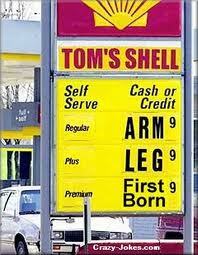 Let’s stand together for one day and show the world we are tired of being gouged at the pumps. If you agree (which I can’t see why you wouldn’t) resend this to all your contact list. With it saying, "Don’t pump gas on April 15th"
Lyle provides a link to an article of January 31, 2011 on Yahoo Finance entitled "Exxon profit up 53 pct, best quarter since 3Q ’08" which I guess is his justification for him organizing this protest. The gist of this Associated Press article is that Exxon earned $9.25 billion in the last three months of 2010 making it the best quarter since 3Q 2008. I note that the return is $1.85 per share, up from $1.27 per share a year ago. [laughing out loud] Ah, excuse me. [standing off to one side waving my hand for attention] May I point out that this public protest isn’t really going to do anything?Rex Tillerson, the Chairman, President and CEO of Exxon Mobil knows full well that you’re all going to buy gas on the 14th or the 16th. Just because you pick the arbitrary day of the 15th doesn’t mean you are going to in any way affect the company’s bottom line. If Rex hears about this – and I doubt he will – he’s going to give this 5 seconds of his time, just long enough to say, "Ooo, I’m quaking in my boots. I’m scared." Now, on the other hand, who’s going to drive less and take public transit more? Who’s going to get rid of one of two cars and attempt to drive less while sharing the remaining vehicle? Who’s going to join a car pool for work? Who’s going to get an electric car or maybe a hybrid? Sure, not pumping on April 15th may make you feel good; it make give you the illusion that you’re "doing your part" but true change doesn’t come from depriving yourself of gas for one day, or electricity for one hour, but that’s another story. Don’t forget, Exxon like any company has the goal of making money, and it’s making money for its shareholders. Feeling left out? Why not buy some shares in the company and have some of those "obscene profits" go into your bank account. Become a shareholder then think about your situation in relation to the company. You want your shares to generate money to go in your pocket. The company has to make a profit in order to pay dividends. Well, the more obscene the profit, the more obscene the dividend. You can read the financial headlines detailing how Exxon has once again broken a record while you’re on your way to the bank to deposit your dividend cheque. Buying a share or two in the company could very well change your entire perspective on April 15th. Heck, maybe you can start a counter-Facebook group called "Buy more gas on April 15th". You just may be able to increase the amount of your 2nd quarter dividend. Gee, why not make the 15th of every month "Buy more gas" day! Think about it. You’ve got a student loan to pay off. You’ve got a mortgage payment to make or you have to pay your monthly rent. Heck, you need money to buy gas. (How ironic is that?) Let’s get those dividends up! It’s money in the bank! According to the Yahoo Financial article, Exxon made $1.85 per share in 4Q 2010. If you owned a thousand shares, you would have made $185 for doing nothing. But let’s further detail this. At the time of the Yahoo article, an Exxon share cost $80. (Now it’s trading at almost $84.) That $1.85 is for one quarter or $3.42 per year. A return of $3.42 on an investment of $80 is 4.28%. With the interest rate on a normal savings account sitting around 2%, putting your money in Exxon shares doesn’t seem like a bad idea. Of course, the company has to make a profit to pay you a dividend so I don’t think you really want to see the company not turn a profit. Hmmm, is this a Catch-22? Lyle, I know you mean well but your protest is ludicrous. It may be symbolic but it’s ineffective. You are desperate to do something, anything, unfortunately in the short term this is meaningless and what’s even more unfortunate is that over the long run, you will more than likely do none of the things I stated above which would truly make a difference. Giving up gas for one day is one thing, giving up gas permanently by taking public transit is, well, a sacrifice that the majority of us may not quite yet be ready to make. [chuckles] Let’s not go overboard! And now, time for a Matrix imitation. I dress up in a suit, put on my sunglasses, then in my best Agent Smith voice I drawl, "Mister Anderson… "
The Exxon Mobil Corporation, or ExxonMobil, is an American multinational oil and gas corporation. It is a direct descendant of John D. Rockefeller’s Standard Oil company, and was formed on November 30, 1999, by the merger of Exxon and Mobil. Its headquarters are in Irving, Texas. Rex W. Tillerson (born March 23, 1952, in Wichita Falls, Texas) is the current Chairman, President, and CEO of Exxon Mobil Corporation. Every time Agent smith says "Mr. Anderson"
Okay, the above Mr. Anderson video was meant to be funny. I was tempted though to put in the Agent Smith speech to Morpheus from the first Matrix where he compares humanity to a virus. Considering we’re talking about oil, pollution, and putting profit before anything else, that clip may well be very pertinent here.